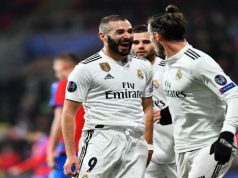 Real Madrid put presure on Atletico Madrid and Barcelona as they earned a comfortable 4-0 win over Eibar. 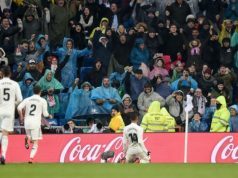 All goals came in the first half, with James Rodriguez, Lucas Vasquez, Cristiano Ronaldo and Jese Rodriguez getting their names on the scoresheet. Zinedine Zidane lined-up several regular substitutes. In fact, only Pepe, Ronaldo and Casemiro remained from the starting eleven that faced Wolfsburg in the Champions League. The hosts took the lead with only four minutes on the clock. Dani Garcia brought Jese to the ground with a rash challenge and James stepped up to send a beautiful free kick past Asier Riesgo into the bottom corner. 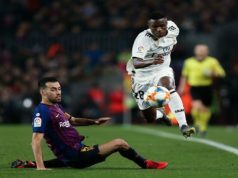 Fifteen minutes later, Los Blancos doubled their lead when Ronaldo used his strength to hold off Pantic, before setting up Vasquez, who scooped the ball home from close range. Eibar were very weak defensively and not even one minute later the hosts had their third. Jese raced clear and found Ronaldo and the Portuguese netted his 30th league goal of the season. A few minutes before the break, Jese Rodriguez made it 4-0. Ronaldo raced down the left before picking out a fine pass into the Spaniard, who had the simple task of beating a hapless Riesgo from close range. Eibar improved in the second half, but they were unable to beat Kiko Casilla. Real could have also increased their lead, but Ronaldo sent an effort to wide of the post. Now Los Blancos focus switch to the Champions League quarter-final second leg against Wolfsburg, as they face the difficult task of coming back from a 2-0 defeat in Germany.